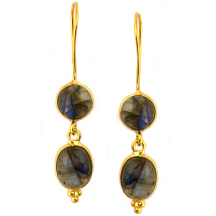 Lovely Labradorite Earrings! Silver and plated in 18kt gold. Beautiful blue iridescent hue to these gorgeous "goto" earrings!